So after a bit of prodding from some of my friends and several readers, I’ve finally decided to write a book. I figured I’d share it with you all so you can see where I’m going with this and see what your thoughts are. You guys know more than I do what you would like to see in a book and what works. I looked at the available books out there and think there’s a need for a beginning prepper book. Something that is geared toward the 95% of people out there who either just started prepping or are thinking about getting into it but don’t know where to start. I’d like to have enough information in it though that someone with more experience would still get something out of it. If you’ve read any of my stuff so far, you know I’m big on living with a balance in your life. It doesn’t do much good to focus all your energy on preparing for a comet to come destroy civilization as we know it and then not put a jack in your car to fix a flat tire while driving through a deserted back road in the Wintertime. 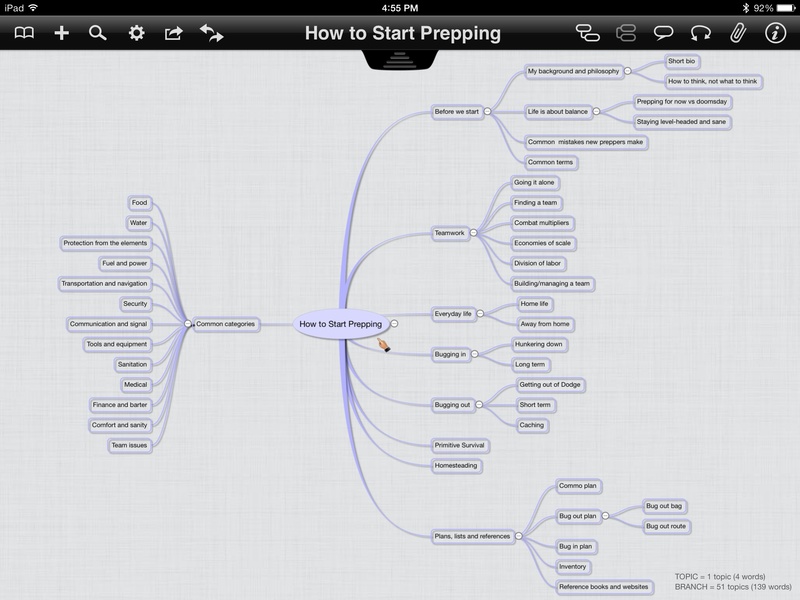 I also think that you really need to be working with others on preparing for things. Teamwork is essential for not only surviving, but surviving well. The first step of this project is to come up with a good outline of the chapters so I know where the book’s going to go. Click the image at the beginning of the article if you’d like to see my first draft of how the book will be heading. 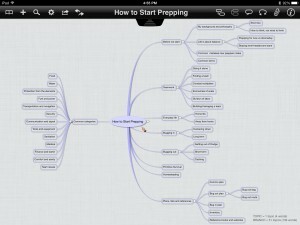 It’s a mind map image, which is a great way to get your thoughts in order. After I get that finished up a bit, I’ll have to write a book proposal. I’ve already been speaking with a publisher so I’m lucky that I have an idea what they’re looking for. I’ve also had a lot of help from my friend Angery American. He writes some damn good fictional prepper books written so check it out if you haven’t already. So far, he’s written Going Home, Surviving Home, and Escaping Home and has more coming. Sooo… As I mentioned, the whole point of this post isn’t just to let you know that I’m doing this book. I’d be interested in what you think about the categories as well as what you think should be included. I’m sure you’ve all read other books and thought, “Great book but I wish they would have just…” I’d be interested in knowing more than just what’s been written in the reviews. Comments below would be great but you can also post on my facebook page or just send me an email. What would you like to see in this book? P.S. Don’t forget about the body armor giveaway that ends on 9 December. Please share that link with anyone you think would like to see it. Ok so most likely the last question you would expect from this post; but what iPad application is that you are using to do the planning? I would love to see more step by step guides. I’ve seen a lot of books that present so much material it’s overwhelming. I’ve enjoyed material that explains how to build a stash of food one week at a time with specific examples of what to buy each week. If you took that approach with several aspects – communication (how to take steps toward ham radio license), defense (self-defense skills each week, firearm training, ammo purchases, etc. ), energy needs (solar, generator, heat, etc). If I knew I was getting a plan that would lay a solid foundation in 10 weeks and would cost between $x and $y, it would be invaluable. I’ll keep that in mind JW. Graywolf, you have in the past touched on the mental discipline required to be successful in a difficult times, including Kims game and the advantage of being the unobserved. Both very valuable skills. Hopefully we all recognize the value of physically healthy diet and exercise, and practice those things. Perhaps some more insights into the mental aspects of survival would be in order. After all the most important skills are the ones in your head, not your bag. Great point David. In each chapter, I have a section that I’m currently calling ‘Comfort and Sanity’ that will cover things like that, but the title is gonna have to change. Top Prepper Site voting page. I expect to come back often. One suggestion: Put your Risk Assessment Matrix from ‘Why Are You Prepping?’ right up front. Everybody need to figure out their own most important events to prepare for, ranging from cutting their thumb while making dinner to a massive earthquake. As you have pointed out, we all benefit from sitting down and figuring out which are most important to prep for before we start gathering our supplies and learning all the interesting stuff about the wrong calamity. Even people who are convinced that TEOTWAWKI is inevitable in their lifetimes still need to put out the kitchen fire next month in order to get to TEOTWAWKI. And to have fire insurance before they have 5 years food in the basement. It is also useful to secure the house against burglars well before armoring the walls and securing the perimeter against an attacking paramilitary group. You have obviously figured that out, but I see a lot of people on other sites who are a long way from doing so. Too many seem to think the remote-controlled belt-fed machine gun on the roof comes before six months expenses in the bank. As someone who co-authored a couple titles via the traditional route, don’t do it. I regret it, that’s for sure. In this day there is no need to go the traditional route with a proposal, publisher, the whole bit. I would also strongly caution against going with the first (or only) publisher that contacts you even if you know someone that has worked with that publisher. If you are going to write a proposal, at the very least shop it around. I am writing some new stuff now and I will never go the traditional route again. Ebooks are the way to go, and if you want hard copies as a personal goal you can use services like lulu.com. There is no need to go the traditional route. Do it yourself and retain all of the control, all of the benefits and all of the profits. Editing, proofing, cover art etc can all be sourced at any of the freelancer sites, no problem. Whatever you decide, good luck! Writing is a blast and a great way to build alternative income streams.